When the temperatures heat up, I look for fresh, cool and quick recipes to make. This salad was all of the above, plus it was so darn delicious. 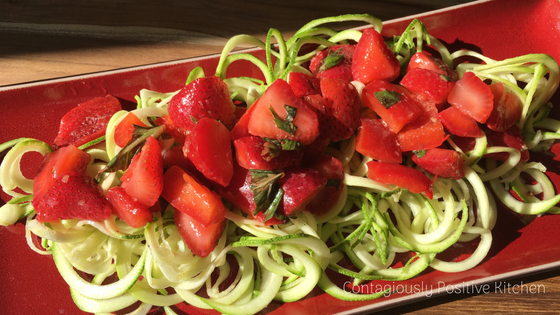 You can serve it on a bed of spiralled zucchini, like I did, eat it on its own, or even toss it with some fresh spinach. This salad is also very much an anti-negativity recipe. The berries nice bright red hue offers up a massive antioxidant punch and is full of vitamins and minerals to help not just your health, but also your mood. Strawberries contain vitamin B1 (thiamine), which has been linked to improving your mood. B vitamins are often described as the anti-stress vitamin. If you are feeling sluggish, tired and irritable, I highly recommend having your levels checked. Many women need to take a B-vitamin supplement. Adding strawberries to your weekly meal plan, especially in the summer when they are fresh, is a great way to give your brain an extra dose of positivity. Add all ingredients to a large mixing bowl and toss together. Season with sea salt and black pepper to your taste and mix well. If you are using Parmesan cheese, add it when you serve. Best served at room temperature for optimal flavor. For more recipes, check out The Contagiously Positive Anti-Negativity Cookbook.